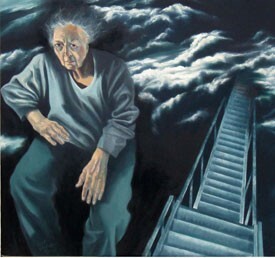 Detail of "'May You Live Forever"
Jewish Art Salon member Janet Shafner passed away August 2nd this year. A memorial exhibit on her work will open September 14 at the Hebrew Union College Museum in New York. In this review Menachem Wecker delves into the unique subject matter of Shafner's work.